The MVSN (Milizia Volontaria per la Sicurezza Nazionale) started out as an organization not unlike the German S.A. (Brown Shirts). They were purely a Party orientated organization, and like their German Counterparts wore a distinctive uniform – a black shirt and a Fez. This led to their popular nickname of Blackshirts (Camicie Nere – Camicie = Shirt & Nere = Black). Later the term CCNN was adopted for Blackshirt military units and is taken directly from the initials of Camicie Nere. MVSN and CCNN are generally interchangeable, however the former primarily refers to political orientated parts of the Blackshirts, while the latter is generally used in reference to combat units. 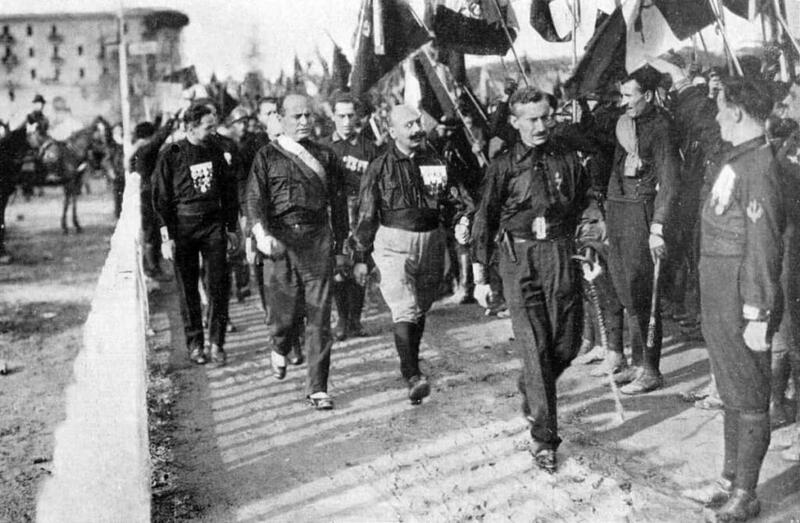 Mussolini in the company of Blackshirts on the March to Rome in 1922. At least one author (Victor Madeja) has suggested that the Blackshirts may well have been the Red Shirts, adopting the traditional colors of Garibaldi’s famous units from the Italian Wars of Unification, had not red been synonymous with Communism and Marxism. However, it would seem more likely that Black was adopted as it had been the uniform of the Arditi (Shock Troops); who had represented the Elite of the Italian Army in World War I. The Arditi were the Italian equivalent of the German Stosstuppen (Storm Troops), and in both countries, fascist groups adopted these troops uniforms as a means to attract Great War veterans to their ranks, and to generally emphasize their links with Veterans Organizations. This was all part of their political aims/plans to recruit public support. (The politics, however, are not the point of this article and I do not intend to discuss them at any length). It is possible that many served in the Blackshirt Militia Units for a chance of immortality (or Glory – such as Garibaldi’s Red Shirts achieved), or in support of Republican political views (which didn’t necessarily mean long-term support for the fascists). Either way there was plenty of loyalty towards fascism and the fascist party in the Blackshirts, but certainly none towards the King and the Monarchy. Mussolini was a sort of de facto Commander in Chief, although only an Honorary Corporal, and just one of the boys, it was he who exercised real power over the organization, rather than the Console Generale. However, unlike their German counterparts (who were literally exterminated in the Night of the Long Knives), the Blackshirts were reasonably secure and stable. Both Mussolini and the Fascist Grand Council required the Blackshirts for muscle since the armed forces were controlled by Monarchists (who saw Mussolini as a threat to their own power) and there was possibly concern (or paranoia) about how much support the Fascists really had. It has been suggested that a sizable portion of the population may have sided with the Monarchists (and the King) if forced to choose, however, support for Mussolini and the Fascists (and also for Hitler and the Nazis in Germany) was probably a lot more widespread in their respective countries than people concede today! Technically the Blackshirts consisted of volunteers who had completed their 18 months compulsory service. Volunteering meant a term of service of 10 years, albeit very part-time service! Volunteering was usually seen as mandatory (like all totalitarian regimes of the early 20th Century, enlisting in some form of party organization was actively encouraged, but was not usually compulsory unless a Public Official such as School Teacher or Government Officer). It certainly was not enforced, and many avoided enlistment. The MVSN were very short of Officer and NCO material for cadres and this too contributed to the sometimes-low level of enlistment. As I mentioned I do not intend to discuss the political side of Italian Fascism here, but would mention that it did not seem to include the Genocide and level of Racism promoted by Hitler and the National Socialists in Germany. Furthermore, although the Italians did not have an equivalent of the S.S. (An army of fanatics with allegiance sworn to one man); and although admittedly there were some similar comparisons between the MVSN and the S.S. at the start of the war (both were Para-military organizations not very well equipped for genuine military service); the MVSN were not involved in mass Genocide like the S.S. nor did they (later in the war) become an elite private army who got the best of everything. Finally, the Blackshirt Officers were often appointed for political zeal, and loyalty (not necessarily to the Fascist Grand Council, but to the Ras – The local Party Organization Chief). The Italians took a very individualistic approach to many things, including politics; so, the Fascist Grand Council often had little input, everything being controlled by the Duce and the Party Secretary (who essentially rubber stamped everything the Duce did). While the Ras in each area did as they pleased since they believed they were directly subordinate to the Duce (including building Militia that were, hopefully, loyal to them personally)! Ultimately this meant the Militias were not always as well led as they could have been, and they suffered correspondingly. CCNN Legion HQ: 2 Bicycles, 2 Motorcycles, 1 Car, 1 Truck, ? Carts, 9 Animals. CCNN MG Company: 4 Carts, 41 Animals. 2 CCNN Battalion HQ: each 5 Bicycles, 2 Trucks, 5 Carts, and 16 Animals. 2 CCNN Recon/Scout Platoons: none. 6 CCNN Rifle Companies: each 1 Bicycle, 20 Animals. Note that in some cases the Battalions had 3 Platoons per Company with only 3 LMG each. Blackshirt Legions were identified by number, while Battalions were identified by number and name (the name would be the region the unit came from, or a famous Italian Fascist Hero – including current members of the Fascist Grand Council). In the A.O.I. (Africa Orientale Italiana – Ethiopia, Somalia, Eritrea) during the invasion of Ethiopia, 7 CCNN Divisions were formed with the hope of establishing a reputation and an Espirit du Corps. Many of these troops subsequently served in the Spanish Civil War (on the Nationalist Side), where casualties were very heavy. These troops provided an experienced Cadre for the new (1940) divisions to be built around, however, due to the losses in Spain only sufficient cadre could be provided for 3½ Divisions (which were duly formed in Libya). This Cadre, however, did go some way towards compensating for the lack of equipment and training in these divisions, but even so, the poor equipment and weapons establishment ensured they would struggle in a modern war. At this time, Mussolini also envisaged the CCNN Legions as being the Arditi (Shock Troops or Elite) of the Army, despite their lack of heavy weapons, and the need for more extensive training. In North Africa, in 1940 the CCNN Divisions quickly showed the results of their poor organization and equipment. Although supplied with a cadre of combat experienced troops, and individually brave, they suffered from the lack of heavy weapons and poor command and tactics. The result of this was to cast doubt on them as viable combat troops and provide ammunition for the Monarchists in the army who opposed the use of the MVSN as combat troops. The CCNN Divisions were loosely modeled on conventional Italian Infantry Divisions; hence, the organization of the Legions differed from that given above and actually mirrored Infantry Regiment organization. The individual CCNN Battalions, however, were organized the same as above, rather than as conventional Infantry Battalions. Arrived at Taguria, Libya in mid-1940. Invaded Egypt as part of 10th Army in September 1940. Retreated to Libya in December 1940 and was destroyed at Bardia in January 1941. Arrived at Garien, Libya in mid-1940. Invaded Egypt as part of 10th Army in September 1940. Elements of the Division were detached out to the Libyan units, including both Legion Gun Batteries (each 4 x 65/17), 2 Gruppos of Artillery Regiment (each 12 x 75/27), and the Engineer Company from 202nd Engineer Battalion. Division retreated to Libya in December 1940 and was destroyed between Sollum and Halfaya and at Bardia in January 1941. This Division was well below establishment and lacking many heavy weapons. It is sometimes described as equivalent in strength to a single Regiment (Legion) from another Division! In some accounts, it is not even mentioned. It arrived in Taguria, Libya in 1939. It invaded Egypt as part of the 10th Army in September 1940. Retreated to Libya in December 1940 and was overrun and destroyed during the retreat. The division arrived at Taguria, Libya in October 1939. Invaded Egypt as part of 10th Army in September 1940. Covered the retreat of remnants of 10th Army back to Libya in December 1940 and was destroyed at Sidi Barrani while doing so! 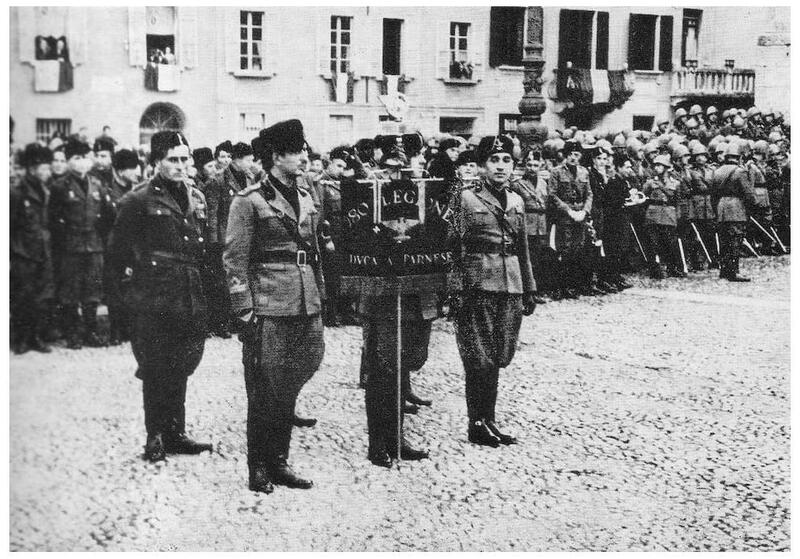 CCNN units would not return to North Africa until 1943, when the 10th Voghera M Battalion would be transferred from Albania to Tunisia, and attached to first the 136th Giovani Fascisti, and then later the 16th Pistoia Division. Members of a CCNN M Battalion. Meanwhile, CCNN units were also operational in the A.O.I. (Africa Orientale Italiana – Ethiopia, Somalia, Eritrea). In the theater Divisions did not operate as such, instead, they served only as administrative organizations. The Brigade (or Regiment/Legion) was the operational unit in the A.O.I., the bulk of the troops being Colonial units of Ethiopians, Somalis, and Eritreans. However several units of metropolitan (European) and Colonial (Settlers) Italian troops fought in this theater (In the case of the CCNN the latter are marked with the d’Africa notation). As previously mentioned a holding and Administrative unit – Its component units operated independently. This Division’s name was later resurrected for a short period in 1942 as the cover name for the Folgore Parachute Division during its deployment to North Africa. This formation served in the Greek campaign and was disbanded at its conclusion. This formation was assigned to the XVII Corps and operated in Yugoslavia. It was disbanded at the conclusion of the Greek & Yugoslavian Campaigns. This unit served in Yugoslavia in the Librazhd sector. Later both The 10th Voghera and 29th Arona Battalions would serve in this theater on anti-partisan duties. They would later be joined by the Raggruppamento 21 Aprile CCNN. The following is a brief list of CCNN units that saw active service and are not covered elsewhere in this article. It is not exhaustive. In Italy Blackshirt Territorial Defence (Home Guard) Battalions were also organized, and grouped into Zone Commands. Each of these corresponded to the area controlled by an Army Corps. Before mobilizing, these units were identified by number (Roman Numeral) and were referred to as Cohorts, their subunits being Centuries (Companies) and Maniples (Platoons). These units would be mobilized as required to form Combat legions. Meanwhile, in April 1940, Mussolini discovered that the Army had been resisting the integration of the Blackshirts into their divisions. The Duce responded with a new program to force the execution of his policy! Meanwhile, in North Africa, the CCNN divisions had performed poorly, principally for the reasons mentioned previously (poor equipment and senior command), and this appears to have been used as an excuse by the Monarchists in the army to further resist Mussolini’s instructions. In the A.O.I. however the CCNN units performed quite adequately, probably due to the lack of mechanization on both sides (it was a cross between modern warfare and the old colonial era), which proved that the basic quality of the troops was probably acceptable – providing they had reasonable equipment and leadership that was comparable to that of their opponents. The exact manpower of these battalions varied – from 570 in a battalion attached to a Motorized Infantry Regiment, to 614 in a battalion attached to a Motorized or Bicycle Bersaglieri Regiment. Note the Rifle Companies in some cases had 3 Platoons. Experience in the Greek Campaign in 1940 quickly showed the weakness of the Italian formations, exposing the error of adopting a Binary organization. Italy had, shortly before the outbreak of the Second World War, reorganized its Infantry Divisions to a new establishment of only 2 Regiments each (hence the Binary term). Effectively this allowed them to significantly increase the number of Divisions, but (in retrospect) at a cost in fighting power – it was clearly proved that Infantry Divisions of only 6 Battalions simply did not have enough resources, either on offense or defense. This became evident in Greece where as soon as a Division was heavily involved and had significant casualties it was forced to pull out of the line due to lack of manpower, it was further evident in 1941 in North Africa where during the 2nd Siege of Tobruk (1941) there were not enough troops to rotate units in and out of the front line. This therefore indirectly supported Mussolini’s call, and it began to be envisaged that the Blackshirt Legions would become the third Regiment of each Division. At this time, Mussolini still envisaged the CCNN Legions as Elite Shock troops who would spearhead the attack. The third regiment idea eventually failed, it was 1942 before the incorporation was completed, and the mobilization effort was inadequate. Blackshirt units generally failed to reach anywhere near their official establishments (not that many regular army units were any better), and although the Army eventually conceded (admitting it had no choice due to a desperate need for manpower) it was still obstinate and unenthusiastic about the system. Furthermore, the separate division idea had been somewhat discredited by the results in North Africa – which was an unfair indictment of the troops that had fought in those divisions. Although in that case, everyone ignored the fact that the fault lay just as equally with the Army (who failed to supply adequate modern equipment) and Mussolini (who forced the campaign to begin despite such obvious shortcomings)! By late in 1942 there had been 41 Legions incorporated into Army Divisions, despite the fact that many were well below strength. 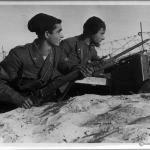 By this time, however, CCNN battalions were being withdrawn from first line divisions just as quickly. Usually, because their training and leadership was not up to a suitable standard, but also occasionally because of poor performance in actual combat situations. Some were caught in an Italian Army Merry-Go-Round and were ceaselessly transferred from one Division to another. Finally, some of the better battalions were given independent assignments as GHQ, Army, or Corps troops, to be attached to Army units as and when required. A member of the M battalion. During all this confusion the better units were being built up into respectable combat groups. They were given the designation M alongside their names in the Army OOB to indicate their status; that they had received specialist assault and combat training, or had proven themselves in combat and had received a battlefield promotion to this status. The M may have stood for Mussolini since the insignia was actually designed to match the Duce’s handwriting (although it has been suggested by one author it stood for Morte – Death). 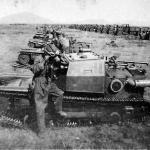 In August 1941 the Gruppo Battaglioni Tagliamento CCNN arrived on the Eastern Front, followed by the Raggruppamento 23 March CCNN in February 1942, and the Raggruppamento 3 January CCNN (which incorporated the Tagliamento Gruppo); later in 1942. By early 1943, these units had all been destroyed during the Soviet Winter Offensive, the few survivors returned to Italy. The University Militia was primarily responsible for pre-military training, and it was the main source of Junior Officers for Fascist units. A Legion of University Militia fought in Ethiopia, and many members of this Militia served in Spain. The Anti-aircraft and Coast Defence Command was an HQ that controlled 2 militia organizations, the units would be assigned to the local Military command and issued equipment from army stocks. This was one of the most powerful Fascist organizations, and although not of a very high (military) quality they still controlled a large number of weapons and equipment (The bulk of which was handed over to the Germans in September 1943). All males between 18 and 37 years of age who were unfit for normal military service were drafted into these 2 Militias. The Anti-aircraft Artillery Militia was responsible primarily for the general AA defense of the country; they were a sort of second line force, equipped with antiquated and/or obsolete weapons (including the 75/27 and 75/46) lacking modern fire control. In mid-1943, attempts began to re-equip these units with a new generation of Italian AA weapons, including 37 mm, 102 mm, and 105 mm weapons. Typically, each Legion would have 64 Guns and 32 HMG, divided into 2 battalions (each of 4 batteries). Total strength of this force was about 60,000 men. The Coast Defence Militia staffed coastal batteries (other than those in port areas which were manned by the Navy). Strength unknown, but possibly around 20-30,000 men. The Railway Militia primarily were responsible for railway security and provided guard detachments for trains and stations, however, on occasions, they also supplied personnel to operate the trains as well. Strength 30,000 men. Forest Militia was responsible for logging and forestry, but also for the protection of these resources (such as fighting forest fires). In Ethiopia and Greece, some specially trained Forest Militia units served as Combat Troops. Strength 5,000 men. The Frontier Militia were used to assist the GaF (Frontier Guards) and the GdF (Finance Guards) in securing the borders, collecting customs and taxes, and so on. All members were mountaineers with a good knowledge of Italy’s wilder frontiers. Strength was about 2,400 men. Finally, there were 3 minor militias: Post and Telegraph, Roads, and the Ports Militia. The names pretty much describe the function, and all 3 combined contained less than 3,000 men. I highly recommend Victor Madeja’s Italian Army Order of Battle for anyone starting out on researching units of the Italian Army in WWII, while Rex Trye’s book provides an excellent starting point for the Italians in general. 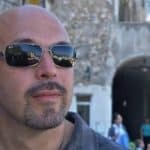 Finally special thanks to Rex Trye (New Plymouth, New Zealand) and Arturo Lorioli (Rome, Italy) who have helped me with my Italian research and especially Arturo who has been a great source of information himself!